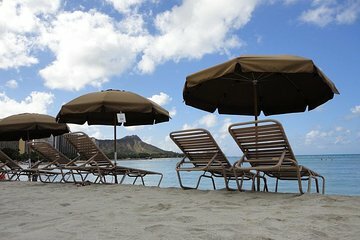 Pre-book your beach umbrella and chair set for an easy and relaxing way to enjoy a day on Waikiki Beach. Settle in right in front of the Royal Hawaiian Hotel and enjoy the beautiful views of Diamond Head and the ocean as you relax under the shade. Bathrooms are conveniently located at Duke’s Waikiki restaurant and check-in is 15 minutes before your scheduled time.